There can be few places on earth to match the magnificent scenery, or the salmon fishing, of the north highlands of Scotland, a land of rugged mountains and open moors, of shining lochs and rushing rivers, a wild, uncrowded land with red deer on the hill, grouse and curlew on the moor, trout in every loch and, best of all, salmon in every river. 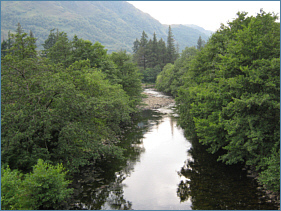 The largest of the northern salmon fishing rivers, the Ness, Conon and Beauly, flow eastwards to the North Sea, in sharp contrast to the short, tumbling streams of the western slopes. In some, there is the chance of a salmon from opening day in January, while others, particularly the spate rivers of the west, must rely for good fishing on summer rain to bring the salmon up from the sea. The map below shows the main salmon fishing rivers on the northern Scottish mainland, in the north highland counties of Caithness, Sutherland, Ross and Cromarty, Argyll and Inverness. Clicking on a blue dot will take you to a page showing detailed maps of each of the main salmon fishing rivers in the north of Scotland with additional information on the fishing available....... truly superb salmon fly fishing on some of the most attractive rivers in Scotland...... Beauly, Conon, Oykel, Helmsdale, Brora, Thurso, Naver, Dionard, Inver, Kirkaig and many more, as listed in the links to the right of the map. For more information on the wonderful salmon fishing on the northern Scottish rivers, including detailed maps, please select a salmon river by clicking on a blue dot on the map or on a river name in the list to the right of the map.